Kids, Cows and Grass: A new stage for parenting...college kids! A new stage for parenting...college kids! I've said it before...I'll say it again, "I love having older kids!" Recently, I have been hearing friends talk about sending their oldest child off to college...the tears, the depression, the fears....and, believe me, that is not what the kids are feeling! This fall, I will have successfully moved three kids to college. Our oldest will be a senior in college this year, but when she moved to the dormitory the first time it was an exciting time, albeit a bit sad for me and the rest of the family left at home. Deep down, I knew that things were going to change in our relationship, but I knew that she was excited about growing up and being on her own. I remember those days when I was packing up and heading to the dorm to be "a mature adult." Was I ready to be on my own? Was I mature enough to handle the pressures of adulthood? Was I prepared to make good decisions? ....NO! But I certainly thought I was ready! As I look at my job as a parent, I believe that I have the responsibility to keep the final goal in mind: To prepare my child to be an adult who can stand on their own two feet, and help make the world a better place! So as each of our three older kids has approached graduation, my husband and I have identified the most important skills that they need and made sure to teach them those skills. What are those skills you ask? Well...they are different for each child. From learning to do your own laundry to organizing your planner, and from learning to take time for yourself to applying yourself a bit more to classes you don't like but have to take--the skills they need are basically survival skills that they will use for the rest of their lives. The sadness I felt when moving my child to their home away from home has nothing to do with regrets--it is more of the change in parenting roles. I also question the job we did--Have we done the right thing in every circumstance? Is she/he really prepared for this? Am I prepared for the changes coming? Although I was sad when we moved our oldest to the dorm, I tried very hard not to cry as we hauled box after box of her precious things to her room. I smiled and laughed as we filled every inch of floor space with what seemed like way too much stuff for the room. As we hugged when it was time to go, I told her I love her and was proud of her...and walked away smiling. Of course the tears came later (I do cry very easily--just ask the kids) but I didn't want that day to be one of sadness. She was so excited--why should I be sad? A couple of years later when we moved her sister into the same dorm, I felt many of the same concerns. Was she ready? Had we done a good job teaching her the important things? Would she remember what we taught her as the tough decisions came up? But I also knew that this was a wonderful time for her and I kept the tears at bay until I was alone later. 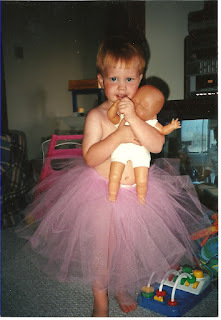 When the girls left for kindergarten, my son wanted to play dress-up like they do! He gave me permission to use this photo in public! This year, we move our oldest boy into the fraternity at college. He has been ready to go for months...well, in his mind he's ready! He hadn't actually packed anything until last night--and he leaves today. I will worry that I didn't remember all the important things that he needs to remember. Will he be fully prepared when the going gets rough? But I know that he will be prepared! He and his sisters are great kids and they have grown up knowing the value of hard work, responsibility and truthfulness. They work hard--and play hard! I know he will be fine. Yes, I'll miss the boy he once was--he was a snuggly, sweet little guy--but I rejoice in the man he has become. I have to admit, that even though I do like babies and I'm the first one in line to hold and snuggle any new babies I see, I do also love the independent, competent beings that my children have become. Having adult kids is really cool! So to my friends who are learning this new form of parenting...remember to celebrate the people you have raised and congratulate yourself on the wonderful job you have done. But, also remember, if they come home every weekend, they are NOT getting the most out of college. Make them stay and get involved in clubs and groups so that they do expand their friend-circle and learn from others! I tell my kids to come home when they want to--they are always missed and welcome, but I want them to come home because they miss us, not because they feel guilty. I have given you wings--now use them! Remember that the mama bird loves you deeply and wants you to be happy! What a great post! I just started my only son in 6th grade, and I love watching him to see what interests he develops, seeing him excel in his classes, easily making new friends. He really is a great kid, and, like you, I always try to send him off with an "upbeat" departure, letting the emotions some to the surface after he's happily on his way. It isn't fair to project our feelings on to our kids...they deserve to be excited! They don't need to feel guilty that Mom is sad! I loved 6th grade with my kids. They change soooo much in that year! Enjoy it and keep smiling. I think it is a great time as a parent. It can be sad, but hopefully we have raised them to be self-sufficient goal driven young adults. I loved the college process and watching ours grow and mature to real adults... it is always a proud moment to know you have done good as a parent. Very well put! Pride in our kids for who they are--is so important! I am also proud of the job we've done raising them. It isn't all nurture, but it has a lot to do with it! Thanks for your support. What a great post Debbie! I hope I can be as positive as you when I pack my baby off to college! Your kids have been fun to watch grow looking in from the outside. I'm looking forward to some more posts on their new ventures!! Your words are so eloquent. My favorite paragraph was the last.....brought a tear to my eye!